New email marketing research gives the answer the the question why subscribers flag email as spam. For what reasons have you marked a business’ emails as spam? The email marketing research was conducted by TechnologyAdvice Research in early March of this year. The 472 respondents are part of a total of 1,358 U.S. adults who were surveyed about their email habits. In case the result surprises you, don’t forget that many marketers have been increasing the frequency of their email marketing programs in recent years. The ‘They emailed too often’ answer from 45.8% of the surveyed people would seem easy to mitigate with a frequency preference option on a profile page. Why am I receiving this? I didn’t purposefully subscribe! The answer in second place is more worrisome: ‘I didn’t purposefully subscribe’ – answered by 36.4% of the respondents. This could either mean that marketers are spamming people (read: ‘are you spamming people?‘), or that people have subscribed, but maybe didn’t fully understand what they signed up for. The above answer can be handled by only sending email marketing messages to people who have actually signed up, -and- by making sure it’s ‘informed consent’: that everyone knows what they signed up for. The third answer in this email marketing research is ‘They sent irrelevant content’ – with 31.6% of respondents giving that answer. This is almost equally as bad as the previous one. The reason for this is that providing relevant content is paramount to the success of email marketing on the whole. If you as a marketer don’t provide relevant content to your subscribers, it’s time to find out what your subscribers want to receive and adjust your content and email marketing program accordingly. To read more about relevant content in email marketing, read this article. 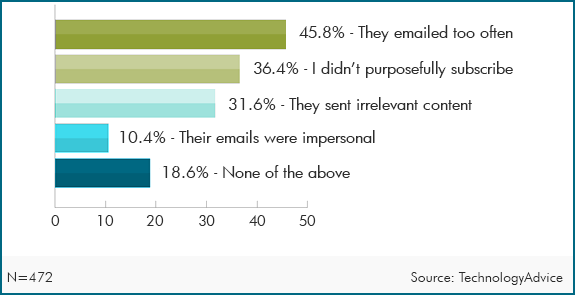 Fourth reason for flagging email as spam is the fact that emails were impersonal. This is strange, as email marketing is an excellent channel for personalisation. Not doing so means you’re not eploring the full potential of email marketing. To see how to achieve good personalization, read about collecting data in the 10 golden rules of email marketing article. In any case, consumers prefer promotions via email, according to a survey from MarketingSherpa earlier this year. This means email still has a good place in people’s minds when it comes to marketing: it just needs to be done better with regards to frequency, relevancy and personalization. For the full email marketing research article and results, head over to the MarketingSherpa website.